It's finally here! 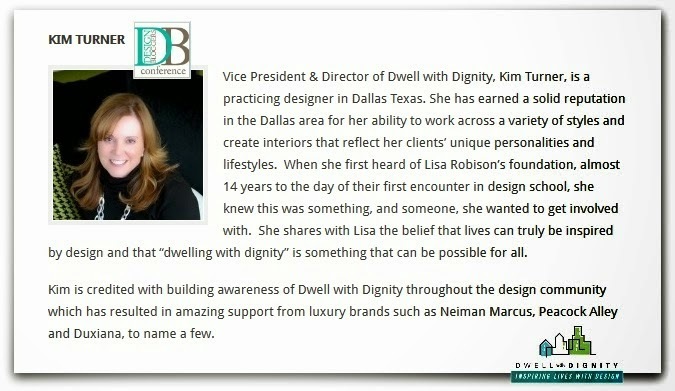 A moment many people in the interior design and design blogging industry have been looking forward to: Design Bloggers Conference! I had attended my first DBC back in 2013, the last year it was held in LA. Last year, the DBC relocated their venue back east to Atlanta, which will be this year host city as well! 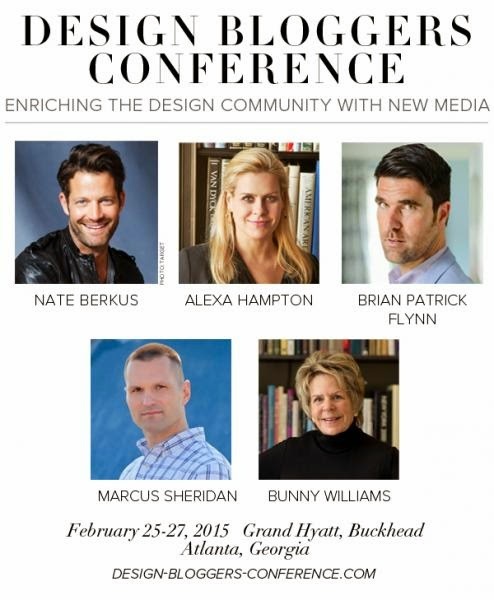 Once again, the DBC continues to dazzle its audience with wonderful keynote speakers - this year including Nate Berkus, Alex Hampton, Brian Patrick Flynn, Marcus Sheridan and --- Interior Design Icon Bunny Williams! 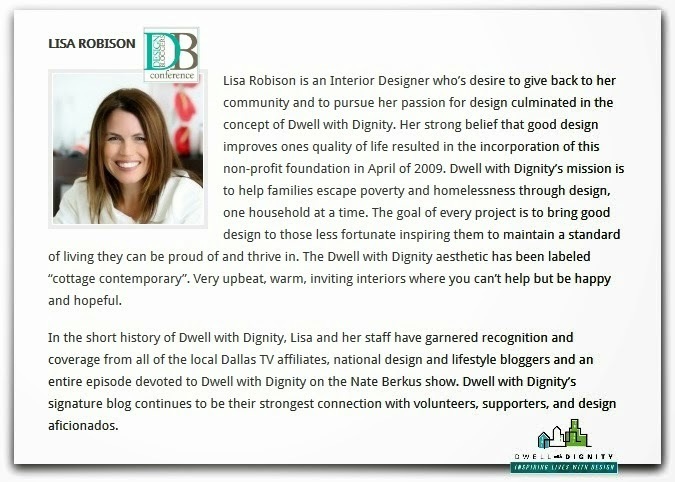 Lisa Robison and Kim turner -- who both presented last year in Atlanta for DBC 2014 and launched the first satellite project (outside of Dallas) for Dwell With Dignity! (You can read more about it from a previous post here). 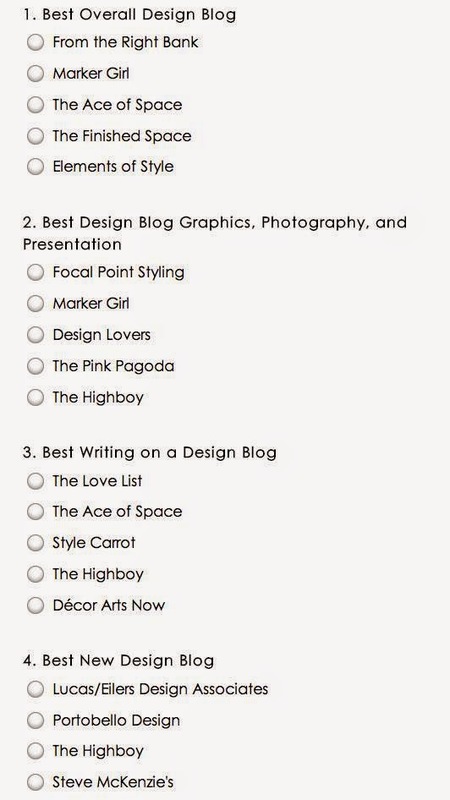 List of DBC - Design Blog Category finalists for 2015! 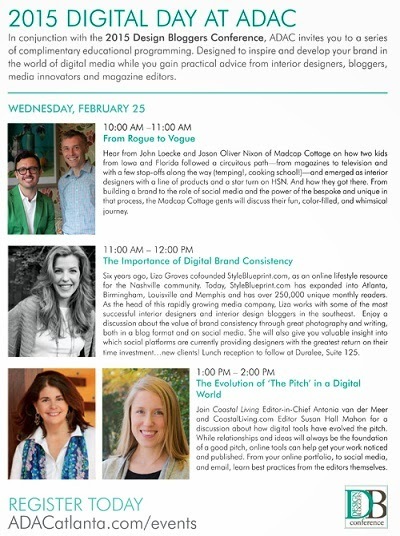 Along with these presentations, held over the course of three days, from February 25 thru 27, 2015 at the Grand Hyatt Buckhead in Atlanta, I'll also be getting to see online friends + connections, and learn new social media marketing strategies + new approaches to blogging. The reward after the day of presentations will be attending cocktail gatherings, making new connections, meeting DBC sponsors, and I'll even attend a dinner I was invited to, sponsored by Traditional Home Magazine + Ethan Allen Home Furnishings. 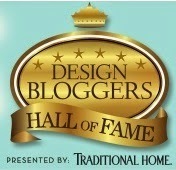 I'm honored and still can't believe that my blog's nomination has lead to me becoming a Finalist this year for the Design Blog Hall of Fame - one of 4 in my category for Best Design Blog Graphics, Photography, & Presentation. Even if I don't win, I'm grateful to have been nominated and become a finalist for 2015! 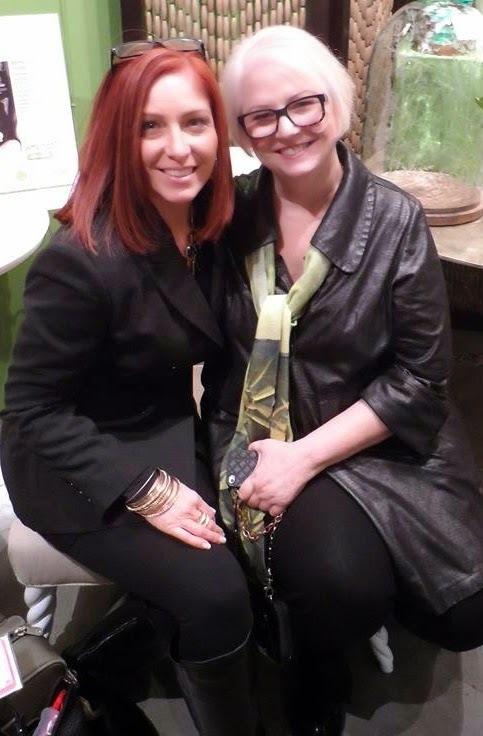 Last time I saw Leslie was during LVMKT - Winter 2014! One of my dear and special online friends I'll be able to see again will be Leslie Carothers, along with two of her clients - Designer Mitzi Beach (who well also be giving a DBC presentation!) and Founding Editor of Hadley Court, Leslie Hendrix Wood - whose blog, Hadley Court, did win the honor of Design Blog Hall of Fame - in the category Best New Design Blog - in 2013! 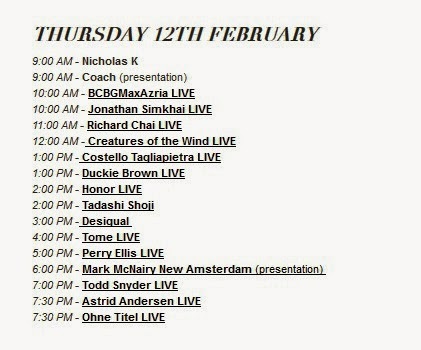 See the full list of all attendees here! 2. Warm slippers + nice PJ's or robe for cold, early morning hotel rooms and answering the door for room service. 3. Casual attire [but presentable] for early morning runs down to the breakfast room or meeting room to grab a quick something to eat/ or to set up - if you don't want room service. 4. There's no time to change between afternoon sessions + evening time...unless you make the time. Suggestion: take a wrap/scarf, a change of jewelry + shoes/purse in my orange roller bag vs. having to go back to my room - that way, it leaves more time for talking with friends, meeting new people, and more time to see sponsors' tables. 5. Take an EXTRA LONG extension cord with multiple plug ins. Pack as many kinds of extra batteries for all your devices as you can. 6. Some people do 2 business cards: One for their regular biz, one for their biz as a blogger. It's not too late to order overnight now from MOO. I also added lip gloss or Chapstick - the cold air can chap your lips - Advil to prevent distracting aches - plus clear nail polish, not only for nails, but as a quick fix for hosiery snags. To help with the packing, I picked up a small garment rack from HomeGoods to hang my items onto take - until they are ready to be folded and packed into the luggage. Afterwards, the rack will make its way into the garage, to reuse for future travel and to create a space to hang garments to consign. I'm just hoping the weather cooperates with everyones travel plans - whether flying or driving - to Atlanta for this year's Design Bloggers Conference! Looking forward to sharing my experience when I get back! You can read my first experience attending The Design Bloggers Conference - here. 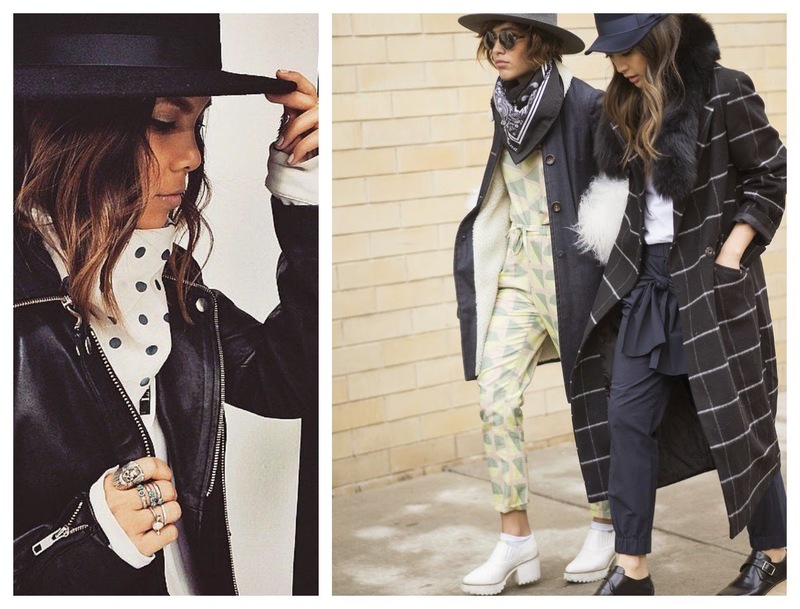 Bandanna + Wide brim hat + Window-pane plaid + obi (wrap) belt + fur detail (collar)... See how to rock the Bandanna trend here, and you too can become a street style star! Wrap it, tie it, tuck it - Read more here. Winter warming trend jolted with color! It takes a MAJOR dose of self confidence to wear what you want how you want it - which all of these ladies have exhibited oh so well (including braving the frigid NY temps and snow!) Yes, some street styles can look like a just rolled outta bed train wreck - and no, not every style is for everyone, but definitely be on the look-out for some of these stylish mixes at retailers near you - and if you can't wait, definitely shop thrift or consignment for those unique to you finds - and create your own street style look, wherever you may be. Red. It is perhaps one of the most dominant and dynamic of all colors. 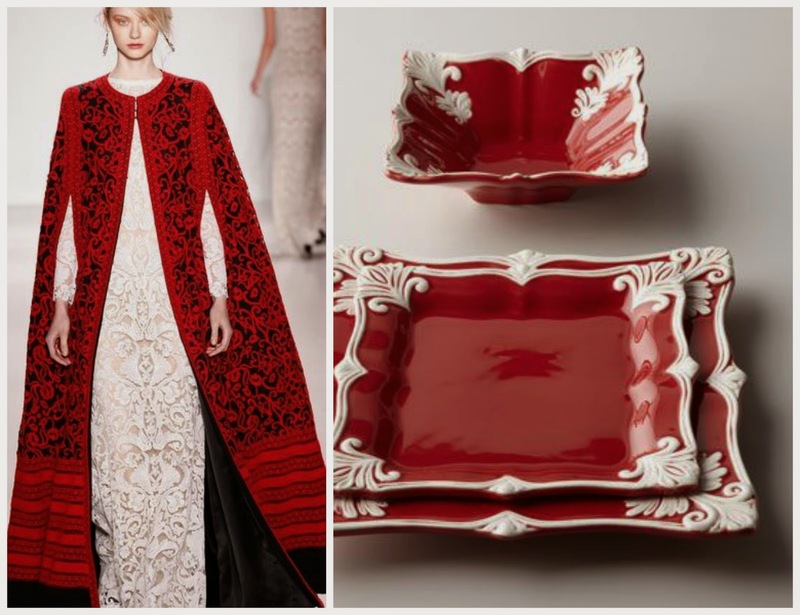 Red grabs your attention and overrules all other hues. Red is the first color we lose vision for at twilight. Objects in red environments may appear longer, thicker, and heavier. Red also causes objects to appear to advance, creating the illusion of the objects appearing closer than they are. 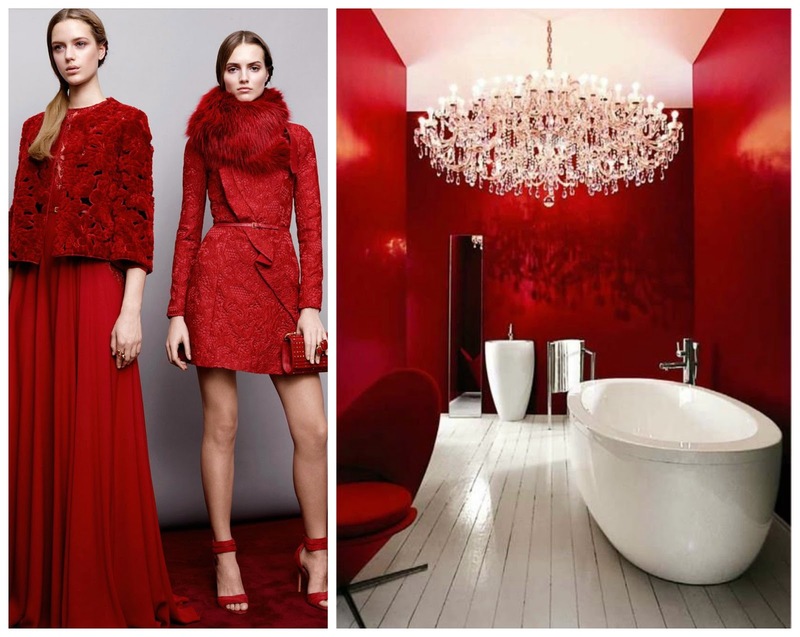 Reds are seen as warm, even hot, exciting, and stimulating. 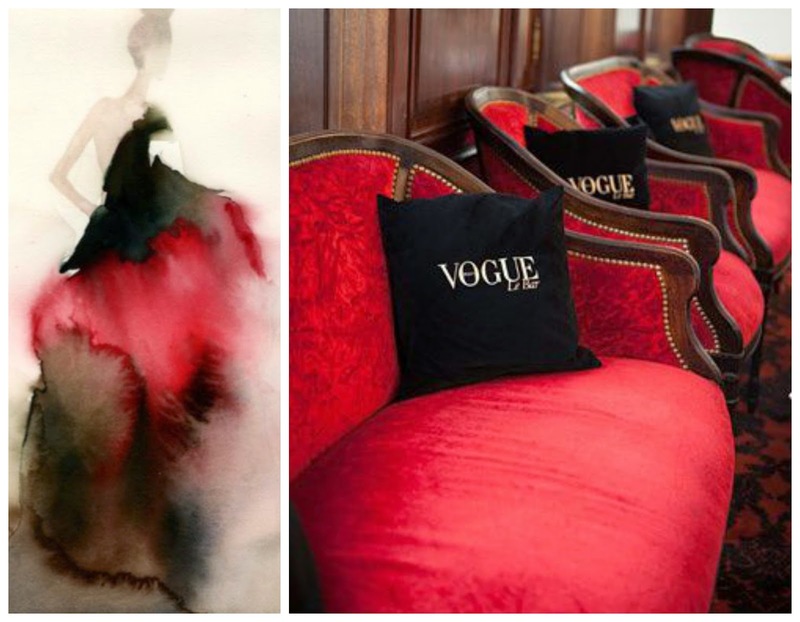 Symbolically, red means fire, life, and strength and it is associated with passion. Men are attracted to yellow-based reds, such as tomato, while women are attracted to blue-base reds such as raspberry. Ellie Saab - Pre-Fall 2015. 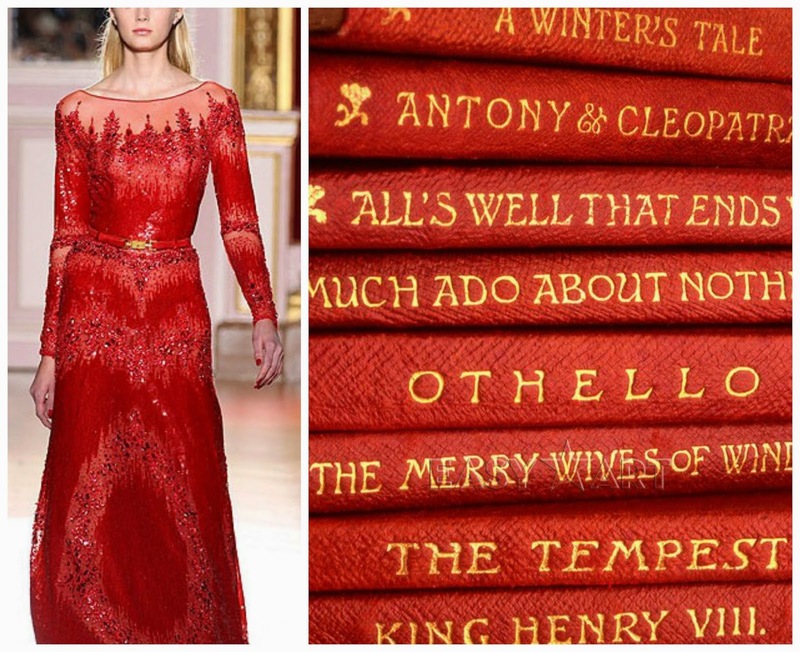 Red - The single most dynamic and passionate color, symbolizes love, rage, and courage. Demanding attention, red has a great emotional impact. Those who select red are aggressive, impulsive, and strive for success. Women raising awareness to fight heart disease and stroke. 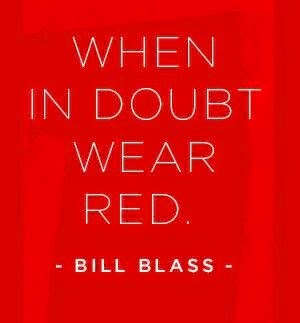 No wonder the campaign is called GoRed - because remember, red symbolizes fire, life, and strength. Watch the GoRed Collection from Macy's NYFW show here. 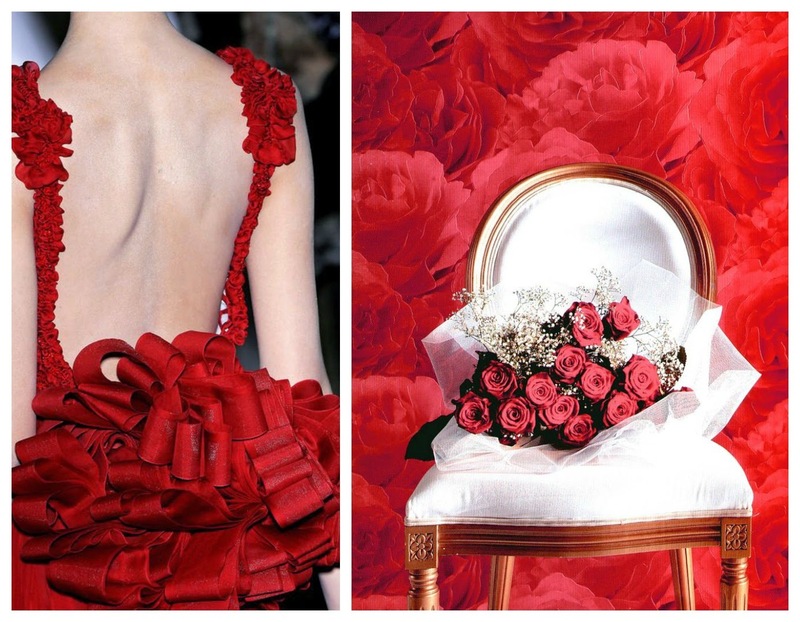 Have a Happy Valentine's (and New York Fashion Week!) Weekend! 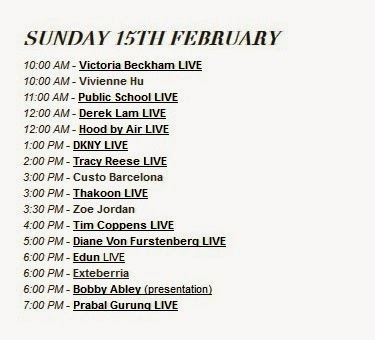 FASHION'S HOTTEST TICKET - NY FASHION WEEK STARTS NOW! 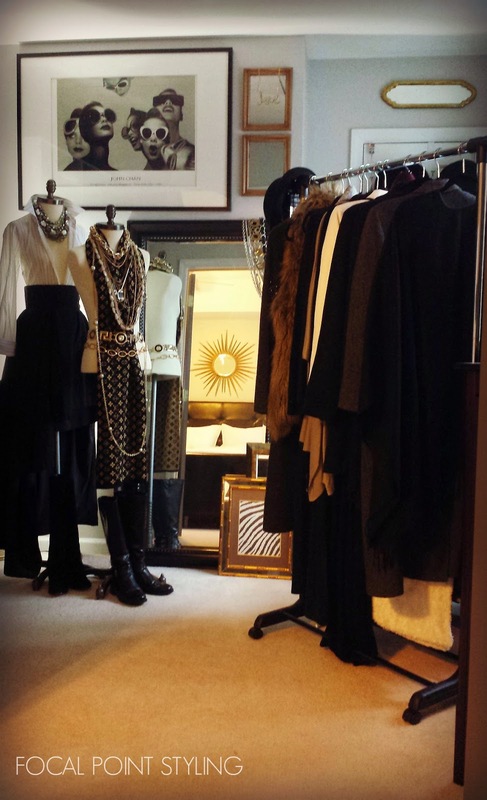 Love it or hate it, like art and interior design, fashion is subject to public opinion. And that public opinion roots itself during the launch of the bi-annually held New York Fashion Week. Always featuring a season ahead - colors, patterns, textures, and silhouettes will begin to make their way down the catwalk for this year's Fall / Winter RTW (Ready-To-Wear) lines today, the start of New York Fashion Week. In attendance will be celebrities, magazine editors, buyers, and even a few future fashion designers getting the chance to see their fashion idols, such as Jason Wu, or the icons in the fashion industry such as Carolina Herrera and Ralph Lauren, as well as pay homage to icons of the past such as Oscar de la Renta - who is still just as relevant today. 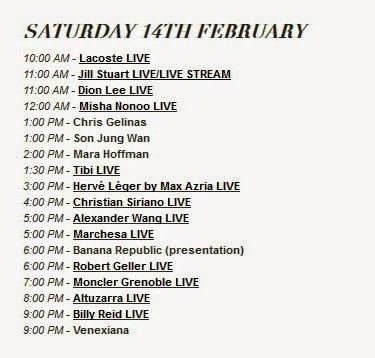 Although we may not have received an invitation to attend, thanks to social media and technology, we can watch these shows, streaming real-time from many online sites -- but my personal favorite site to view these shows on is at nowFashion.com. 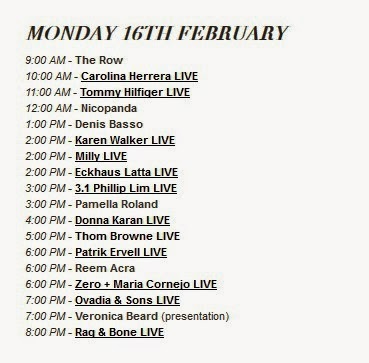 Besides streaming videos of highlighted shows, nowFashion features real-time photographs as a slideshow presentation, making it an excellent source to pin (sample some of my fashion week pins at NYFW SS215) and share your favorites from to your other social media connections (for example Twitter). 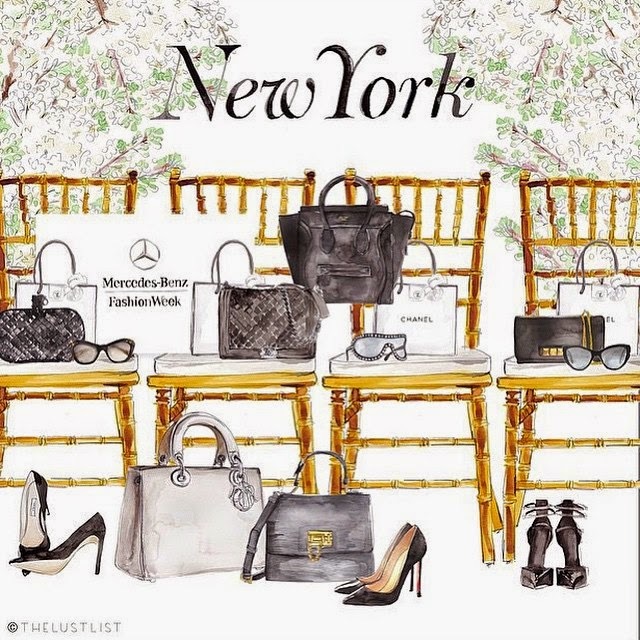 Back in September was NYFW Spring/Summer 2015, which even with all the snow falling down, is making its way to department stores, showrooms, and specialty shops near you - plus you'll also start to see Spring / Summer ad campaigns on billboards, on websites, and it print magazines. 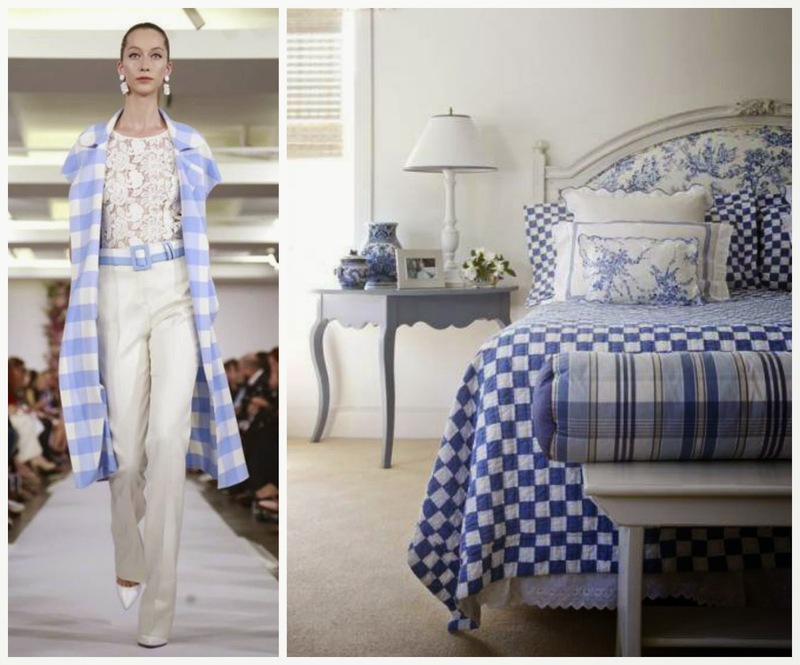 Strong statement from the Spring / Summer runways will also be a popular home decor print. 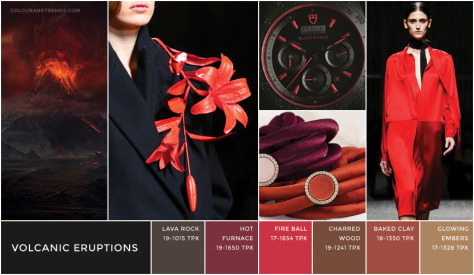 Fall/Winter 2015 Color Forecast from the Committee For Colour & Trends. 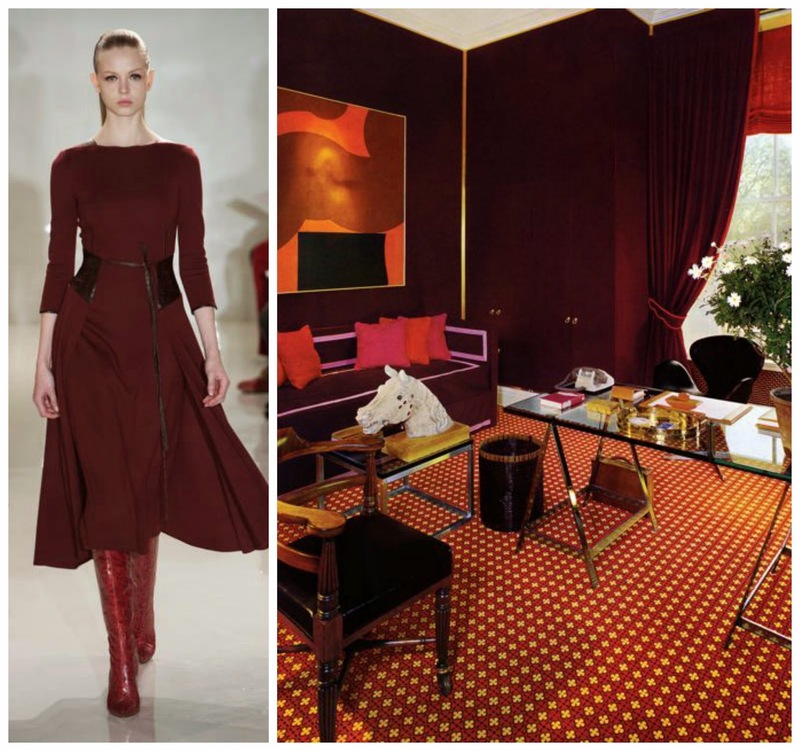 These fashion palettes also play a very important role for influencing our choices for home decor - from textiles to paint - which will be interesting to see how these runway trends will translate into our rooms. To see just how some of these runway looks find their way into styling our home, you may enjoy reading my post at Hadley Court - New York Fashion Week Trends Translated Into Timeless Interiors plus also see additional design duets and previous blog posts featured in my new blog tab above, Fashion & Decor. 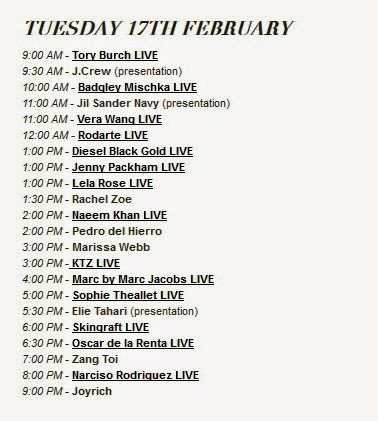 I'm excited to see NYFW - FW2015!! Once a fashionista - always a fashionista!